A few readers were interested how we setup for camping, so while this post won’t be fancy, it will most definitely be informative. 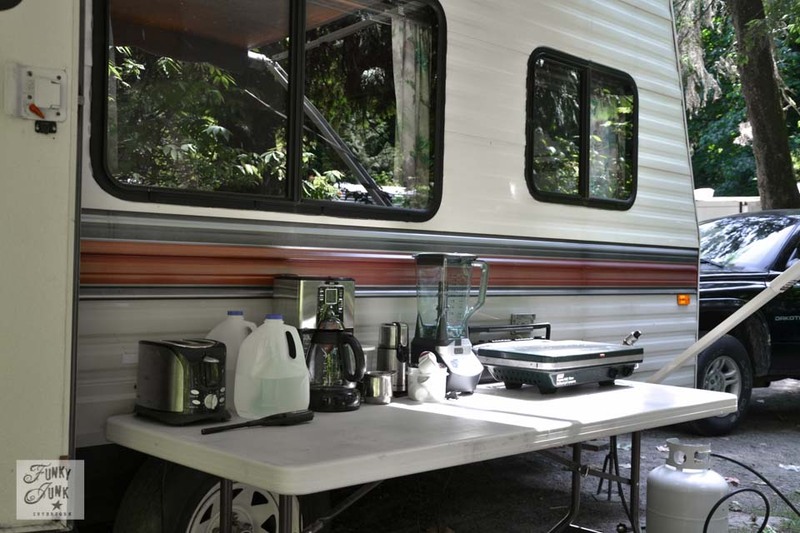 Here are our all time favourite tips for camping in a travel trailer. We are camping veterans. It all started with my mom and dad’s travel trailer. I borrowed it one time to go camping, and from there, it was trailer or nothing. To make matters even more interesting, instead of buying one, for a few years I bartered an actual motorhome! I ran a stripe and graphics biz so I use to stripe a bunch of RV’s in trade for using their finest during a slightly off season. And boy, talk about spoiled. We’re taking real queen beds and the works. But one time we attempted to get it but it wasn’t avail. That enticed my then husband and I to purchase a 24 foot used travel trailer. It was wonderful! It even had bunk beds and a living room with a couch! My son basically grew up in that thing as we parked it full season at a nearby campsite resort for many years. But then one day, I ended up on my own with a little truck that couldn’t pull the big guy. So I sold it and purchased this 16 footer. And that’s where we are today. I can tow my own travel trailer which is the coolest thing ever! Our Terry isn’t fancy, but it’s nice. It’s super clean and in good shape and not too terribly tacky by tacky standards. (you can see the inside of the trailer HERE) It could use some updating like many see online, but to be honest, I haven’t been inspired to do a thing to it. Here’s the thing… we go camping to go camping. And when we don’t camp, I work on the house. So! Maybe one day I’ll be inspired to do something cool to it if we hang onto it. 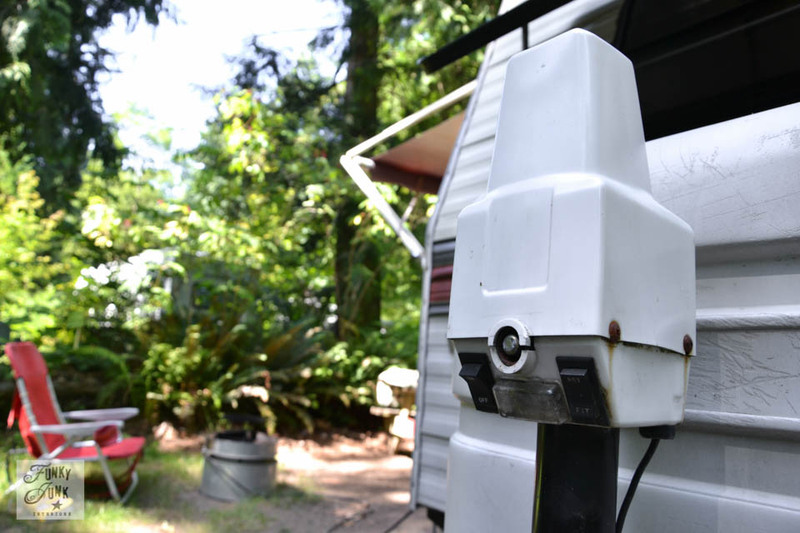 But as these travel trailers get older, they continue to need upgrades. I’m a one woman band here and repairs mean I have to hire out. $Ouch. Owning a trailer is not free. But for this summer, it’s running great and we are getting our money’s worth! Yay! This post contains Amazon affiliate links so you can find everything you need. When we were full season campers, we did things a lot differently such has had a pretty patio with flowers, a fancy painted picnic table and cute benches, the works. Campers always stopped and asked when the magazine shoot was to transpire. But these days, it’s about smack a table up quick and get to the beach! Short term camping means quick setup and take down and our outdoor kitchen works awesome with a collapsable Costco table. This is where we bring all the riff raff outside that won’t fit indoors. I just prefer to cook outside if it’s nice out. We have a lovely stove indoors, but outside is more fun! And more room. See that board underneath the table? 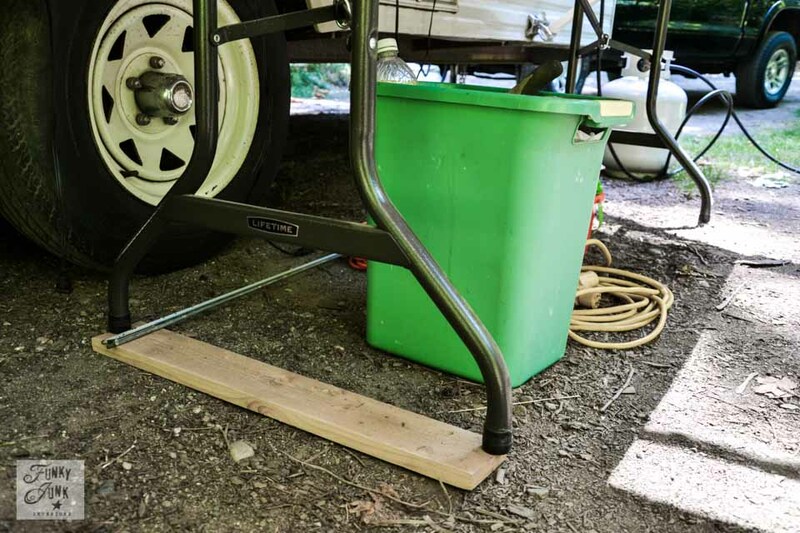 Simple boards will change your camping world. If you are on unlevelled ground, boards come in mighty handy! See how the tires are on boards? 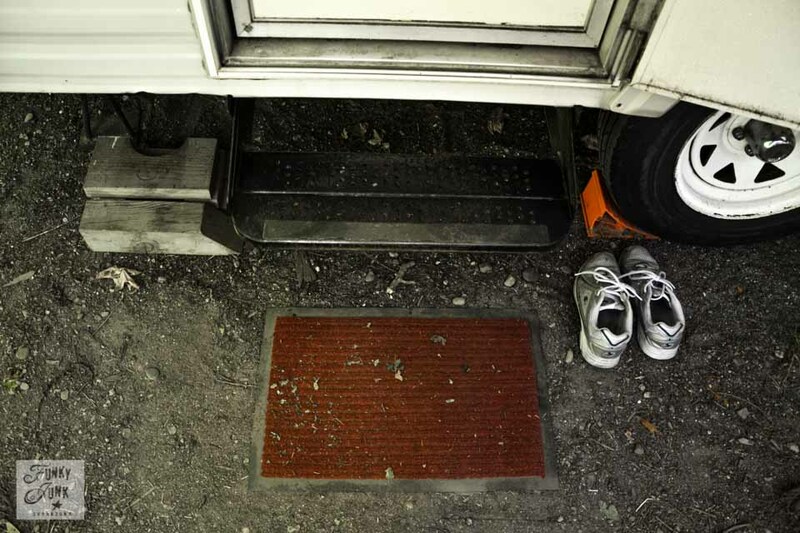 When I drive into a campsite, I grab the level and place it on the floor inside the trailer. I then know how unlevelled things are, and start propping up boards. In this case, I knew one side of the trailer was very low, so I pulled ahead, placed boards behind the tires, then backed up onto them. You can get all kinds of fancy expensive tire level things and wheel chocks that keep your tires stationary, however boards work just fine. 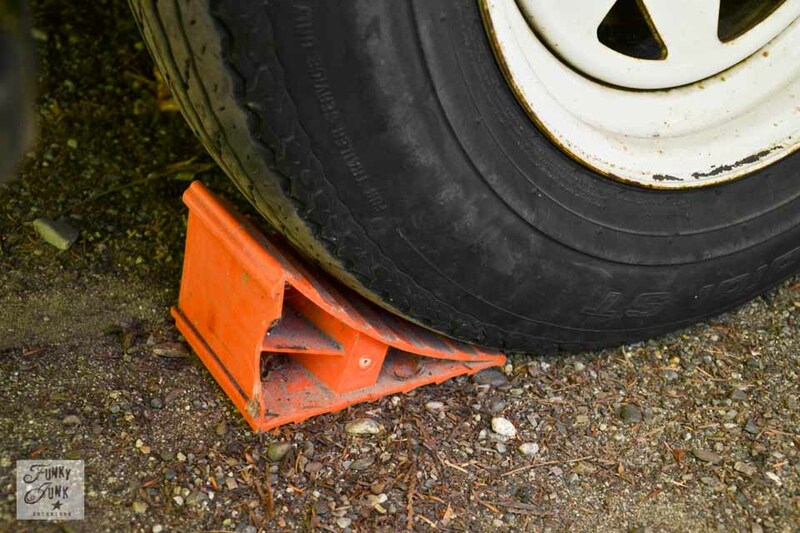 Chocks are necessary so your trailer stays put. You place them in front and behind the wheels so it can’t go anywhere on you. One time I parked on a slight grade that trailed down toward a river. Kinda freaky! Nothing like wondering if you’ll end up in a house boat the next morning. But with wheel chocks, you aren’t going anywhere. It’s kinda like cheap breaks. Here’s where I’m slightly spoiled. Above is what most trailer hitches look like. 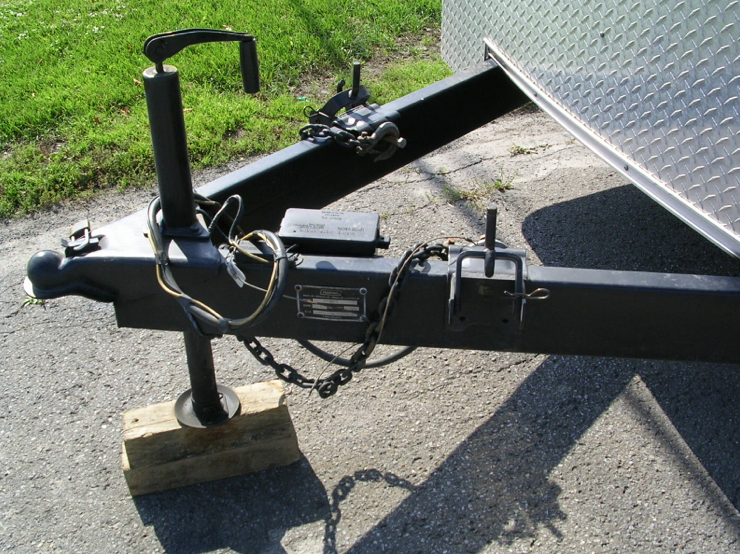 This trailer jack has a crank you have to wind (until your arm falls off) that highers and lowers your hitch. For guys, it’s probably not that big of a deal. But for a girl? It’s a little more so. Mine now has an automatic trailer jack. 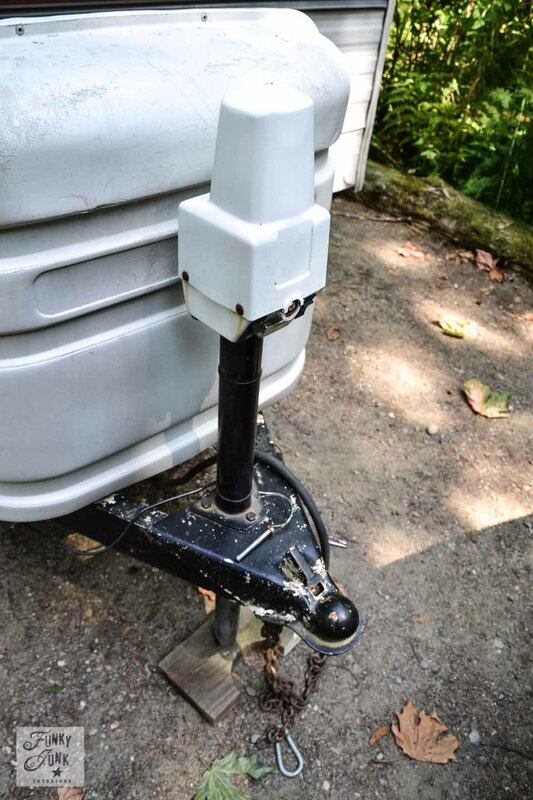 With the flick of a button, I can higher and lower the trailer onto the ball hitch attached to the truck without issue. If you are still cranking, throw that thing away and get one of these. You will want to send me presents, you’ll be so thankful! See that beat up black paint? I just spray painted it tonight so it looks all shiny and new again. A spray bomb works great! But.. you know… I don’t primp when I camp. For those that go camping with a travel trailer on a regular basis, they will laugh at my carpet. This is NOT adequate. Camping carpets truly save your sanity. The bigger they are, the better they keep the mess out of your trailer. I threw ours out a few years back because we were camping at a spot that had cement patios at the time. If we continue to camp, I’ll need to get another carpet soon. I learned this trick from other RV folks when camping. This tip is golden. First off, get a splitter for your water, with two turn offs. What this does is allows one for your drinking water, and one for your septic water. Bear with me, this connection is clean. 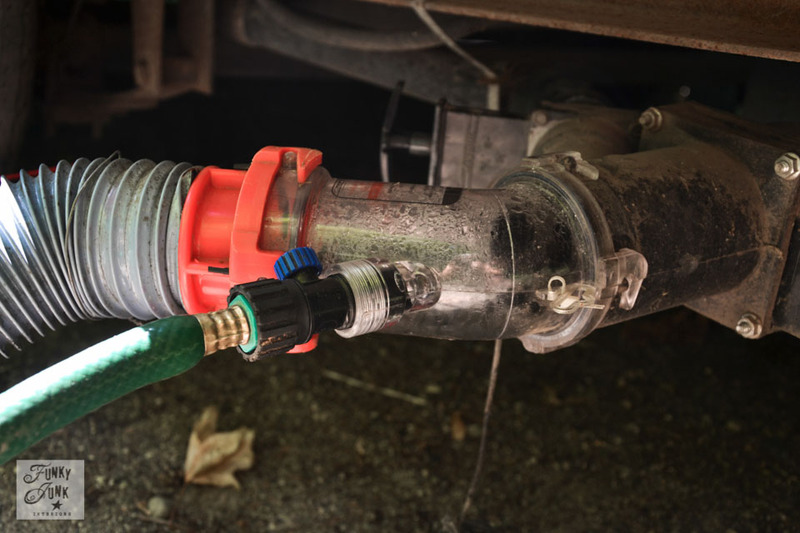 This see through device is a clear sewer hose adaptor extension that allows you to check if your tanks are clean or not when they are emptied. Every trailer has a tank of grey water (dish and shower) and a tank of black water (sewer). When you empty a tank, you always empty the black first. Then you open the grey so the cleaner water further cleans out your hoses. See the green hose? Right after you’ve dumped your sewer, you turn on the green hose and the water will shoot back into the tank. You let it fill the tank until it starts running out again, turn off the green hose and allow the works to flow out. This is repeated until everything runs out perfectly clear. THIS IS A MUST HAVE for any travel trailer. It truly leaves your tank spotless. Now! Lest you think I’m this incredible genius that knows it ALL… breath easy. I do not. Anyone that drives around with a busted taped up light cannot hide the fact that she isn’t the best backer upper in the campground! Ok, so towing a trailer is yet another hurdle I had to accomplish. 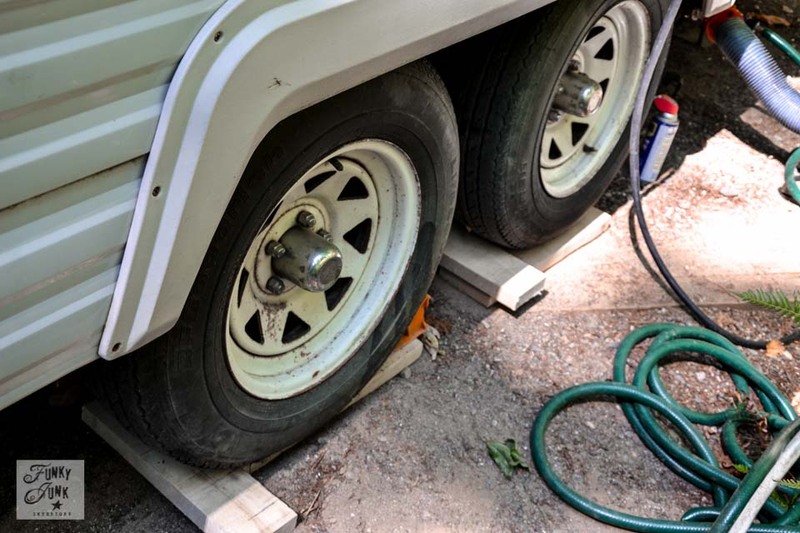 With good instruction and a little practice, it really isn’t that hard to tow a travel trailer and doesn’t take strength in order to do so. 1. Put your hand on the bottom of the steering wheel. 2. If you want your trailer to go left, turn the steering wheel left. 3. If you want your trailer to go right, turn the steering wheel right. The key is your hand sitting on the bottom of the steering wheel while backing up. If you’re new at towing, take lots of time to practice. I like driving down country roads, and attempt to get myself into a bind of sorts, then work my way out of it. Practice really does build your confidence. Travel trailers are a BLAST to use. But they are maintenance and it’s best to use them all the time so all the parts stay working. Tent trailers are another option if you can’t pull a trailer. They are much lighter in weight and are in between a tent and travel trailer, which makes them a super nice option. And on this note, we are off AGAIN to do a short little camping stint with a group of friends this time! Be back soon! Do you have any must hear camping tips? I’d love to learn more! I’ve been following your site for a bit now and this one really got to me. My husband keeps talking about getting a trailer and going cross country. I shake with fear at the thought (The Long Long Trailer with Lucy and Desi always in the back of my mind). But your post today was so informative and user friendly. I hope you make some more on every other aspect: cooking, driving tips, washing up, etc. I think I’ll print them out and make a little Donna’s Handy Trailer Tips booklet. Next time he mentions camper, I won’t start listing the possible hotels with showers and breakfast included we could stop at instead. 🙂 This actually sounds like fun! Oh man, that adventure sounds like so much fun! If you are both brand new to this, I’d sure suggest you rent a small one and take it locally first though. Get a feel for all it involves. And in your case, I’d probably suggest buy new unless you guys are VERY handy. But, definitely, the trial run first! It is a neat lifestyle for sure! this post really brings back memories! We camped in tents for years and then moved up to a pop up camper and you are right: you can never go back to tents. We used to do damage to that thing every time we took it out due to our lack of towing experience and other various mishaps. My husband always said we could be staying four star hotels for what we paid for repairs every year but we always had the most memorable vacations and vacation stories and the kids loved it! I miss that camper and someday I would like to get a small one just for me and the dog. My husband will meet me at the Marriott! I’d love to hear about how you hitch up and tow. I pull a gooseneck horse trailer, but I can’t hitch it up, my hubby does it for me! My goal this year is to learn how to do it myself. I can back it up *pretty well* lol. Oh I love this post! We are travel trailer campers too. We just got back into it this year after being out of it for several years. I must say, I am awed that you tow and have a camper w/out a hubby. You go woman! I recently had to tow the boat on a camping trip because hubby towed the camper and I was freaking! LOL! I like the auto jack, now that’s useful. We have been getting a lesson on towable water tanks as we have decided to do more state park camping that do not have sewer hookups and who’s bathrooms are less desirable then mine. Lesson learned, the bigger the better! We purchased a fairly large mat from walmart for slightly over $50.00 from the camping section. It was the cheapest we saw, anywhere. 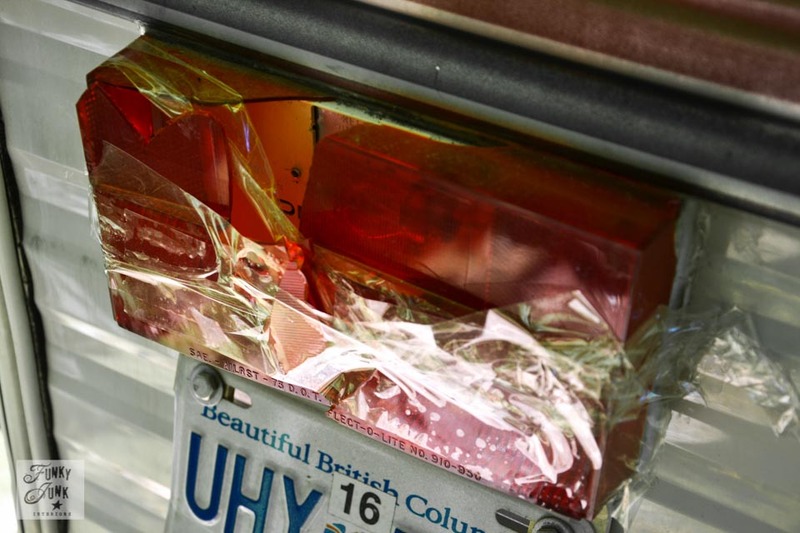 It’s one of the newer style plastic ones that folds easily and can be rinsed and dried easily too. I love it so much more then the faux indoor outdoor grass we used to use. LOL! We set up even less then you outside now. We used to put quite a bit out too but now it’s just the camp chairs, side table, music and cooler. Good times! I hope you have a great trip with your friends! Enjoy!!!! Oh, believe you me, the mere idea of towing myself FREAKED me out at first! Until I learned that the truck does the work, you just have to steer it right. It really is not that big of a deal! I just take the side roads where possible so I can take my time. My truck should really be beefier to tow something this size IMO. If it had more power, I’d be a little braver. Here’s the BEST towing tip I can offer anyone that was taught to me. While backing up, if you want the trailer to go left, put your hand on the bottom of the steering wheel, and turn it left. Same with right. The trick is to have your hand at the bottom. This tip will not fail you! Thanks for the tip on the carpet! The one I looked at was $100 and I couldn’t bring myself to pay that for something so ugly. haha! Will look in Walmart for sure! I should add, I do this kind of setup outside if we go for about a week at a time. I just like to do everything outside if we can… I’m a spaceaholic and love my outdoor kitchen so much! 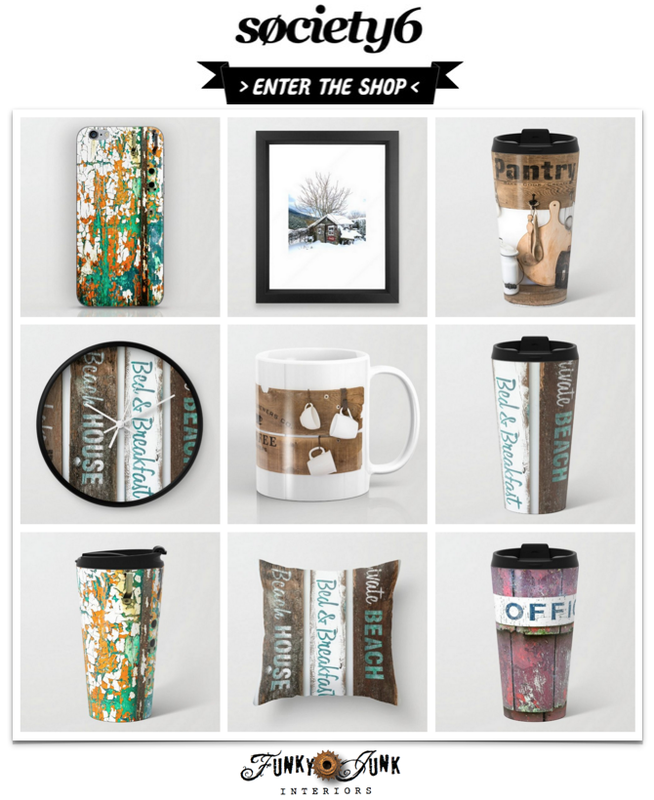 This makes me want to go camping! We used to tent camp all the time when our kids were young. I’ve whined over the years that I want a camper—-no more waking up in a damp sleeping bag. LOL. Thanks for sharing your tips. Haha, I so remember those days! Kids like that kinda thing though so if you stick with the tent, you’re creating cool memories for them. I still remember the smell of the tent, the air mattresses we use to inflate with a foot air pump, the lantern swinging around at night… so fun! I remember those nights of camping in a tent with little ones and as they got older and the more rain storms we got caught in, I finally told my husband if you want to go camping it will be off the ground, the day we woke up and literally float across the tent from the amount of water in the tent. We went out and bought an old pop up and had that for 5 or six years and then bought a new one. we are now in a travel trailer and I don’t think I could go back to a pop up either. I miss camping! My parents had a pop up camper and drove all over the US. It was so much fun. My husband and I have been on several backpacking trips…but I don’t enjoy it like I do regular camping. We talk about buying a pop up trailer but just haven’t done it. Maybe someday soon. We set up exactly the same! Costco table and all. We love camping and the trailer makes camping even better…especially with little kids who you want to keep warm! Yes, yes!! If you have small kids, the trailer made things so much easier. I forgot to mention, I grew up tenting with my parents, but the day THEY made the jump to a trailer, you can bet I had to try it out and was hooked! Our trailer also has air conditioning which is a LIFE safer when you go through a heat wave. It’s been such a blessing for us. Heat nor cold no longer stops us from going anywhere! This post came at a perfect time! My husband and I just bought a used hybrid trailer as an upgrade to a tent trailer and I’ve been relentlessly searching online for any tips and tricks to keep it running smoothly. The part with the sewer emptying is going to be put to use! Any tips on sneaky storage on the inside or outside? Yes. Have a canopy on your truck and put the overflow in the back. It truly saves you! Keeping stuff out of the trailer makes it feel so much bigger. If something can’t go in a cupboard, it goes in the truck, period. Don’t need something? Don’t bring it. Go over everything twice. For extra quilts in case it gets cold, spread them on your bed and sleep on top of them and only pull them up if needed. Install lightweight shelving to the walls here and there for extra storage that won’t topple over. I’ll do a photoshoot how the previous owners decked ours out with this idea. Thank you. That was very informational and it just makes me want to get one on go to the high country to get out of the heat. Hope you had a great one. Loved the article. My partner is/was having a mid-life thing and bought us a 1969 18ft Nomad Travel Trailer. So far we have replaced all of the plumbing. I have torn out some of the walls and replaced them. It is a lot of work and being in Texas it is hotter than hell in that thing. We still have a long way to go before the “B” named for “Plan B” makes her way back to the road. The travel trailer community is vast and I had no idea. I am not really a camper so this experience is going to be a barrel of laughs im sure. Look forward to more Terry stories. Carrie, if I had a partner that knew what they were doing, I’d do the same to a vintage trailer. They are so so cool! Donna, I absolutely love that you camp… most people would never believe that we do. It’s all we do!! We are at the point of having to have 2 hotel rooms and you are soo cooped up it just isn’t fun!! So we started by borrowing my mom’s and then bought a smaller pull behind and moved up to a 5th wheel. The campgrounds we stay at have the most fun amenities for the kiddos and I can’t imagine not camping!! We are spoiled- I have a full size queen bed now that has it’s Costco topper and it’s better than my bed at home!! I love to camp!! Donna, I love these posts on your camping trip. We have camped for years in tents but this year I inherited my dad’s pop-up camper and we have had a blast using it. The best memories are made and we always have alot of friends along. I always like to replenish my camper when we get back home and wash all the linens so we are ready to pull out next time. I like it to be nice…and my husband accomodates my weirdness 😉 Glam camping makes me happy. Here’s the link to our first camping trip this year. Thought you might enjoy. Have fun with your friends. I enjoyed your post. We have been from the pup tent to large tent to pop-up to truck camper to small class c to larger class c to small 5th wheel back to truck camper to larger 5th wheel to our current 38ft 5th wheel. My must have is ABO Gear mesh tubes for our kitties we travel with 4 cats. Also winter in Florida for 4 month so we had to have a way for them to ge out and get some fresh air. Love those things. I’m still a tent girl… but one can dream!! Having said that, I going to have to incorporate several of these tips into my camping-with-tent-only trips. I would never have thought of it, but how handy to put a rug outside the tent; and wood pieces under my truck, goodness knows it has gotten stuck in the mud a few times; and a good sized fold-up table to set up for cooking. I always relied on the campsite picnic table and have then gotten all frustrated when it’s cluttered with both cooking and eating stuff. 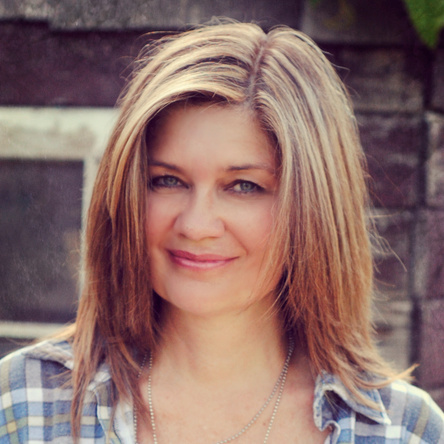 Awesome tips, thank you, Donna! I an very impressed that you do this by yourself Donna–girl power! We love our travel trailer–it is like playing house. My 11 year old organizes it, and reorganizes, keeps a list of things we need, and cleans it. This is only our second summer with it, but we are hooked! 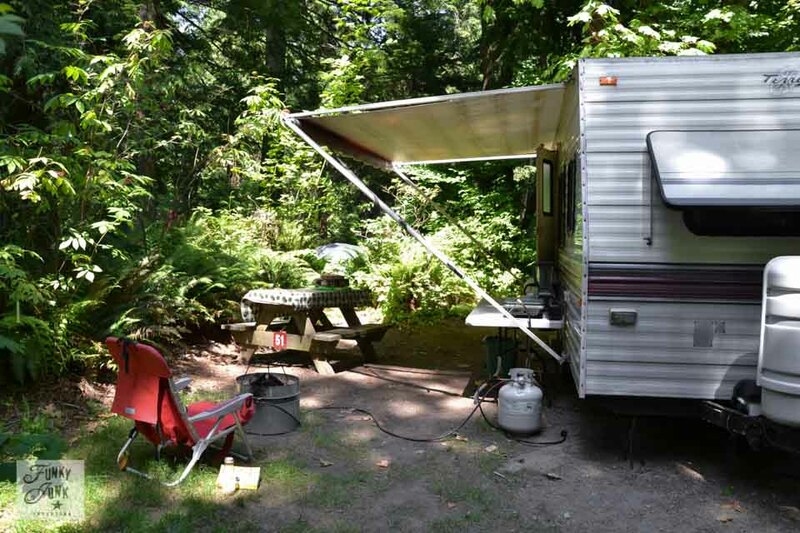 Hi Donna, I just got back from camping and had saved this post about your tips camping with a travel trailer. We bought our 27′ prowler new in 2001 and I have yet to drive the truck towing it! Your post gave a little bit of encouragement for me to attempt it next time out. It would be great if you had more tips to share. Never heard of a clear sewer adapter. I love to camp in my home state of Michigan. There are so many places we love to camp. Hope you will share more tips in the near future. we are 42 year campers, having upgraded from a Ford Econoline van to a sleeper, then pop-up for 27 years, yeah, 27 years in the same trailer, then a hybrid, and now a Fifth wheel. Loved each and every one, as they fit our lives at the time we had them. Now, I find I love having my own bed, my own sheets and especially, my own bathroom. Hubby got tired of being elbowed at 2 a.m. to walk with me across the campground to the bathrooms, ha! You meet the nicest people, have a choice to stay on your own or visit with people. 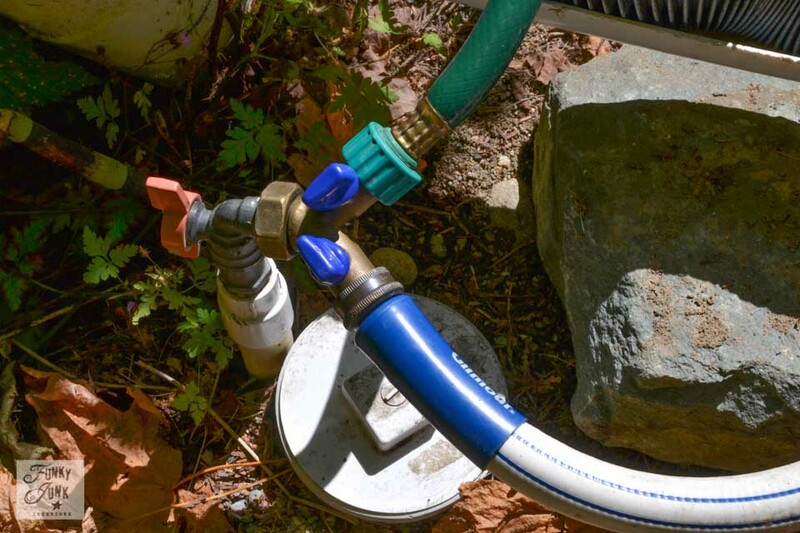 you need a vacume breaker where you tie in your water to your drain wash out. It is very important as you could contaminate the potable water. You can buy one for less than $10 US at any plumbing supply. New to trailer camping here. Haven’t gone on my first trip yet. Like the clear seer hose adaptor thing . What is the vacuum breaker do? Marilyn, I had never heard of it, but after searching it out, it blocks the black water from contaminating the white water somehow. Great tip and something that is now also added to my list! Oh, interesting, I had never heard of one! Thanks Janet! The one at Camping World has a vacuum breaker built in. This one probably does too since it looks a lot like the one at CW. Tim, you will adore that tip and it will stick with you forevermore! Thanks for the kudos and your visit! I found this to be very informative ….. I bought a 14 ft. 1968 Aljo about 12 years ago. I bought her before it was really cool to have a vintage camper but I had a vision of fixing her up and that is exactly what I did. Everybody would razz me and say ” why didn’t you buy a new one?” I just couldn’t see paying the new price and then tearing it apart and making it like I wanted. I replaced part of the floor, rebuilt the booth, rebuilt the bed, put in microwave, shelving, put in beadboard, laid new flooring. reupholstered cushions …….well, you name it I did it. And I am very proud up my trailer (Skidrow Chic)…. Everywhere I camp, she causes a stir. A person can do anything they set their minds too. But I did have electrician rewire and put in breaker box. I did want to live to enjoy her. Fascinating! I LOVE trailer redos! I’m uncertain about camping in the future for us, so I never did redo the inside of ours. But I would in a heartbeat if I knew we’d be hanging onto it! WHere did you get the clear hose splitter/adapter? Hi Kailyn, try any specialty RV parts place. They will have it! Me and my wife camped years ago when our kids were little and really enjoyed it. It’s been a good 15 or 20 years since then. Two years ago I told my wife that it’s been to long since we had any time with just us two. She runs a daycare from home and even Saturdays. I work also so by the time the weekend hits we are DONE ! So I mentioned camping and she was like I don’t know, we’re a little old to be sleeping on the ground, damp when it rains etc… A few months passed so I told her hay lets get a pop-up ? No real reaction other then I don’t think we can afford it, how much will we actually go ? Long story short I when out purchased a pop-up. Took off on Friday and went to one of our State Parks and set everything up. Even put some of those goofy lights on the awning. She like them.The wife worked unit 7:00 pm. so I came back and pick her up. It was only a 45 min. ride. As we drove to our site her eye glazed over as she saw the camper all lit up. I had 2 chairs by the fire pit and started up the fire. It was so nice and quite the fire was crackling. There we sat smiling at each other. Since then we can’t wait until spring and go every chance we get. She loves it and so do I ! Thank you so much for the insight. I travel a lot for my job for months at a time. I am thinking of buying a travel trailer for my travels. I travel with my dog and it’s always a hassle to find housing with her. There are so many places that do not accept dogs or they charge a huge non-refundable deposit. I am tired of this. My dog behaves better than most children. Anyway, I am a single female, so I am a little wary of doing this on my own. I have a 4WD Chevy Tahoe to pull. I am just concerned with how big I can or should tow with it. The Automatic jack sounds like a great option for me. Thank you for the tips!! Elizabeth, I totally understand your hesitation. 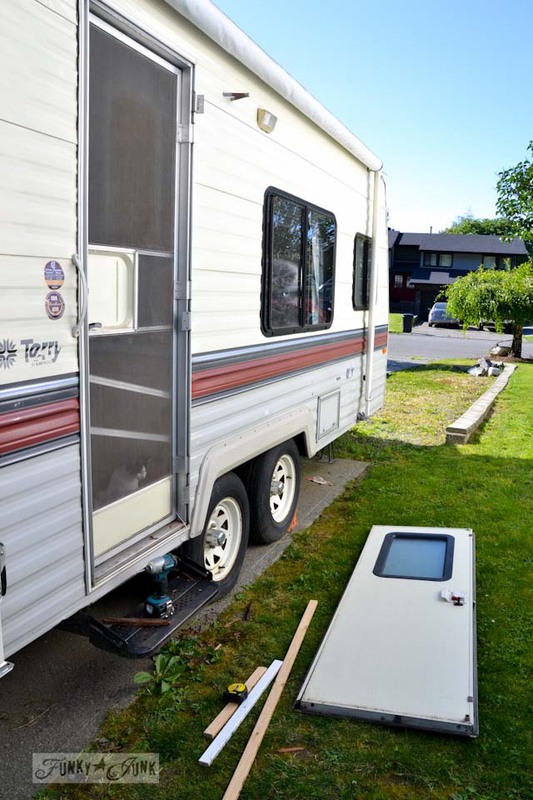 Travel trailers are things that need constant tinkering. If you can afford it, I’d suggest to get a newer and lighter weight one to reduce the need for service anytime soon. You may even wish to look into a glorified tent trailer. If I still camped lots, I’d consider that, they are so nice now and very light to pull, easy to put up. My nephew has one with a vaulted ceiling look and he loves it! Thank you so much for your story, especially the tip about putting your hand on the bottom of the steering wheel to back up. Thank you!! hello – where did you get your automatic trailer jack? New to this, but already ready used to tent, then had a cottage. The kids got the camp and I and wife bought a 16 travel trailer and the adventure begins. Bar harbor and Arcadia National Park for the week. This is our fourth trip out and making memories. And the cat is coming also. How awesome, Paul! I hope you have a wonderful time! Our cats did GREAT! My my, my son, and I decided to go camping in this broken down awful thing someone suckered her into. This was about 19 years ago. Not one of us had ever driven one before but it was May in Arizona and hot already so we took off for California. The entire trip we could still gasoline but she was insistent. We found a park near Sea World that cost a small fortune. The next day when it was time to go I said, “mom you better come back here something must be broken. So she walked around back and she said OMG there was excrement on the ground. We had not been staying at concrete parks before so she hadn’t noticed and we didn’t know about flushing the pipes. My husband recently commented to me that we should go on a road trip in an RV. The thing that I was most concerned about was emptying the sewer tank and how to properly maintain the sewer system. When we go we will definitely have make sure we follow your advice to use the sewer hose adaptor extension. Thanks for the info. First time RV’r, 17 ft travel trailer. Hi Donna, Awesome site here. Been an avid camper ALL of my life.Building lean-too’s and such from age 10. At 57 those days are over. 🙂 20′ Nomad is the house on wheels today with my wife and three boys when we head to the forests of Pennsylvania for 10+ days. Just thought I would add something about outdoor kitchens and lighting. Old school Coleman lanterns and stoves. My oldest 2 mantle is a 1921 nickel plated beauty that works like it was made today. More cost effective than any propane lantern. No bottles to dispose of just filler up and pumper up and now we’re cooking with white gas! There are Canuck models as well. Visit Coleman collectors forum. Johnboy. GREAT tips, thank you so much for chiming in! We are newbies planning our first trip mid September so have been scouring all the info on camping we can find on the net. Appreciate your suggestions and are trying to absorb mountains of info. We have purchased a 2011 Rockwell 30 ft and think we have gotten a good deal. So we will start our journey soon with buckets of info and see if we can apply all of it. Backing up the trailer is always something that I have really struggled with. My husband travels quite a bit and so usually we will meet somewhere for camping. You make it sound so easy in your tips! I usually have my hands on the top of the steering wheel so I think trying it your way will make a lot more sense. I’ll have to give it a shot, thanks for the great advice! I absolutely LOVE and appreciate your tips, Jerry! Agree on all of them! I just read how YOU back up and say if you want to go left turn left and if you want to go right backward, turn right. THAT is confusing for people I think. IF you put your nads at the bottom of the steering wheel, if you want the back of the traler to go left, pull your left hand up with the steering wheeel going up clockwise on the left side and if you want the back of the trailer to go right, bring your right hand up making the steering wheel go counterclockwise. Do small movements. IT IS THE OPPOSITE of how you drive your car and back up. So back to go left, left hand goes up, back of trailer to go right, right hand goes up. Thank-you for sharing your method of backing up. Great advice! I myself find the hand on bottom of wheel a method I don’t have to overthink. I’ve tested it out on lots of friends and they understood it immediately. So I guess whatever works, right?! I just discovered your website today and have really enjoyed reading it. My husband and I will be retiring in a few years and we have been looking at purchasing a small travel trailer to visit the US and Canadian National Parks with our two, and possibly 3 by then, poodles. 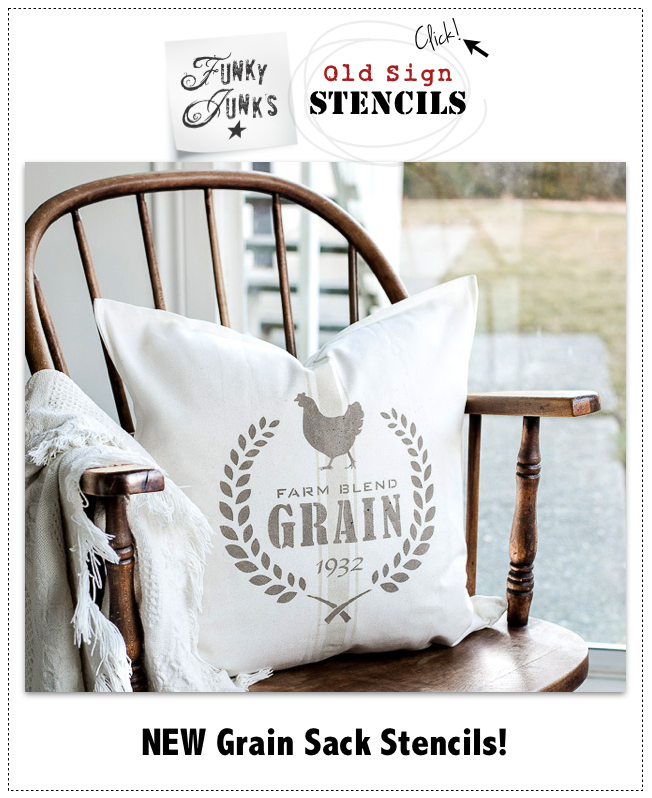 We’d also like to travel the “Steinbeck Highway”. We really like the small trailers and I love your economical ideas. It is possible to spend an absolute fortune on an RV, and that is not our style. I am so inspired by you!! We are SO OVER the big, high maintenance suburban house.We will be downsizing to a small home and a small travel trailer. I can’t wait! In the meantime, I will be following your site and dreaming of the day we’ll own a little trailer of our own. BTW… Does your trailer have a name? I’ve heard of Rocinante (after Don Quixote’s horse) and Rucio (after Sancho Panza’s donkey.